If you always wanted to know how many aircraft were produced during the war years, then this is your must-read list. The aircraft are ranked in order of (American) Aircraft Output/ Quantities made between 1940 and 1945. At the top, I have gathered some production numbers for the German, Japanese, and Russian Fighters made in WW II. The aircraft type that won the “Overall wartime-production/quantity-battle between 1940-45” is probably not what you might think! Find your favorite US wartime manufacturer of fighter, bomber, transport, or specialty aircraft and see how it ranks against the competition in the US and abroad. But be warned: this list is based on official production figures that I could find on the Internet, but this is surely not the complete story. In this Top-25 List, license-built US designed aircraft which were assembled abroad are not included. Also, specialty aircraft built in smaller numbers as Test-beds or Jet-aircraft that were not yet operational by August 1945 are also not included in this list. As a result, not in the Top-25 List is Sikorsky, who made the first helicopter which was operational in small numbers before the end of the war (133 R-4s were built between 1942 and 1945). Also not included is Ryan who built the FR Fireball, a hybrid aircraft with a piston and a jet engine. It came too late for the war. The same is true of the Grumman F-7F Tigercat, the heavy Navy twin-engine carrier fighter. At the top are some early pre-war operational aircraft. The Seversky P-35 and Vought SB2U Vindicator are not included as being (nearly) phased out of production as the war started for the USA in December 1941. Photo above shows the Lockheed C-69, a long-range troop & cargo transport. The Military version of the epic Constellation L-049 was built in small numbers between 1942-1945. 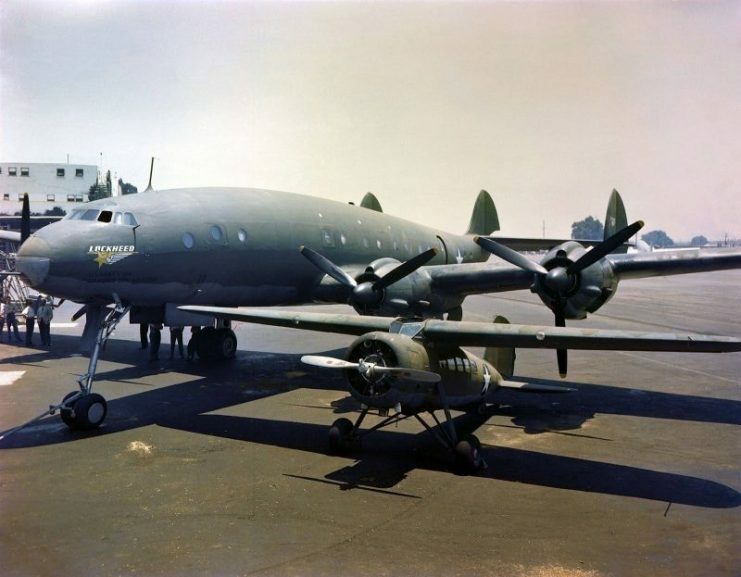 Note the extremely elegant dolphin-shaped design of the fuselage, its most distinctive triple fin tail and its “High Heels” undercarriage, which created sufficient ground clearance for the huge propellers that made this the fastest of all cargo aircraft during that era. Presented below is the Top-25 List of US aircraft manufacturers. While the numbers might be slightly inaccurate, the overall ranking based on the numbers produced will not dramatically change with a few hundred planes more or less. 3 Curtiss-Wright 26,150 P-36 Hawk, P-40 Warhawk, SB2C Helldiver, C-46 Commando. 8 Consolidated 15,000 B-24 Liberator, PBY Catalina, PB2Y Coronado. Large scale outsourcing of B-24 to Ford. 12 Ford 9,000 B-24 Liberator, outsourced by Consolidated to a new Ford Factory near Detroit, MI. 15 General Motors 7,500 TBM Avenger, outsourced by Grumman who built 2,300 of the type. 20 Beechcraft 4,500 C-45 Expeditor, based on Twin Beech-18, 9,000+ built between 1937-1969, longest production run ever! 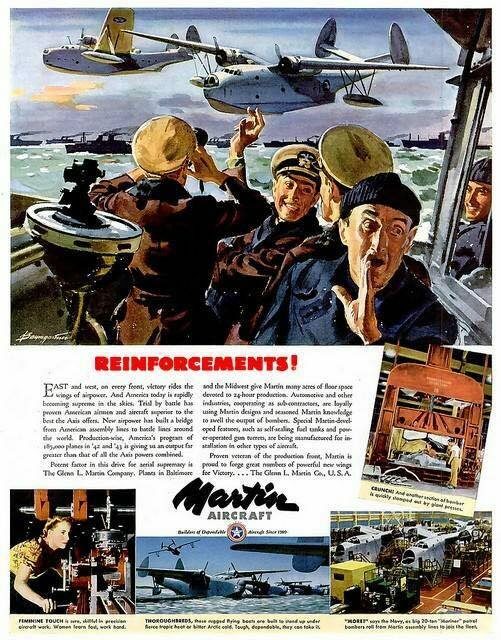 Photo above features a Martin Aircraft wartime ad campaign about the company’s efforts in the US aircraft production with their PBM Mariner. ** The Ranking order shown above in this blog has a relative value. If we redefine the words “Aircraft Manufacturer” to have a broader meaning and add any outsourced production to the original designer-manufacturer, that would rearrange the ranking order and could make Boeing the third largest aircraft manufacturer when we add half of the total Stearman production of 10,000+ Trainers PT-17 to the 16,000+ of Boeing. Also, Consolidated merged with Vultee to form Convair in 1943. If we add the Vultee production and Ford’s B-24 production to that single new company, it would add some 20,000 aircraft to their tally. With that setup, North American ends up by far as the No 1, followed by Convair, Douglas, Curtiss-Wright, Lockheed, and Boeing completing the list of the six largest US aircraft manufacturers in WWII. (The B-24 production had a nationwide spread over five different factories: Consolidated San Diego, Consolidated Ft. Worth, Ford Willow Run, North American Dallas, and Douglas Aircraft Tulsa). 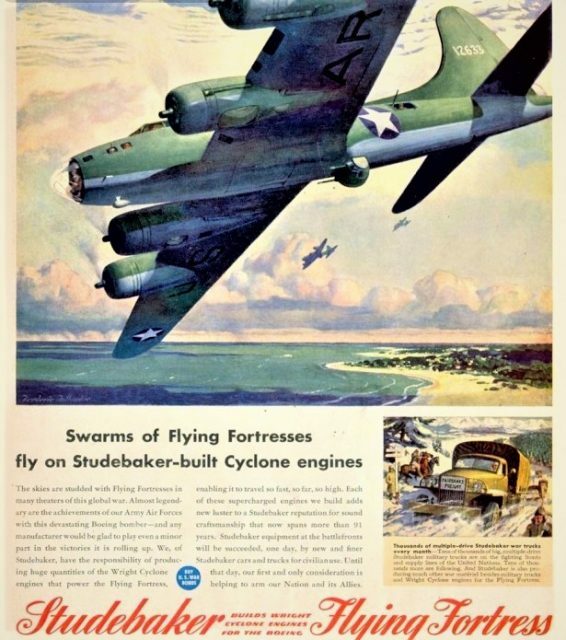 Photo above: Studebaker publicly announced that it made the (Wright-designed) Cyclone 9-cylinder radial engine for the Boeing B-17 Flying Fortress. The German war industry did similar outsourcing but had to keep that out of the public eye in order to avoid being targeted during the next bombing raid over their city! **The Russian Ilyushin Il-2 Sturmovik was a ground-attack aircraft/tank buster, and 36,183 units were produced during the war. In combination with its successor, the Ilyushin Il-10, a total of 42,330 were built, making it the single most produced military aircraft design in aviation history. **The Messerschmitt Bf 109, remarkably, is also often claimed to be the most produced fighter aircraft in history, but with a total of 33,984 airframes produced from 1936 up to April 1945, it falls short when compared with the Russian production of the Il-2 Sturmovik. **The Yakolev Yak-3 — allegedly some 31,000 units were produced in Russia during and after the war. **The British Supermarine Spitfire was produced in the UK between 1938 -1948 in all its Marks with a total of 20,351 aircraft. The other British fighter, the Hawker Hurricane, built 14,583 units between 1937 -1944. **The Focke-Wulf Fw-190 Würger came early in 1941, the same year as the P-38 and five years after the smaller Bf-109, and 20,000 units were built. **The Mitsubishi A6M Zero, Japan’s best fighter, was introduced in 1940 and 11,000 aircraft were built. 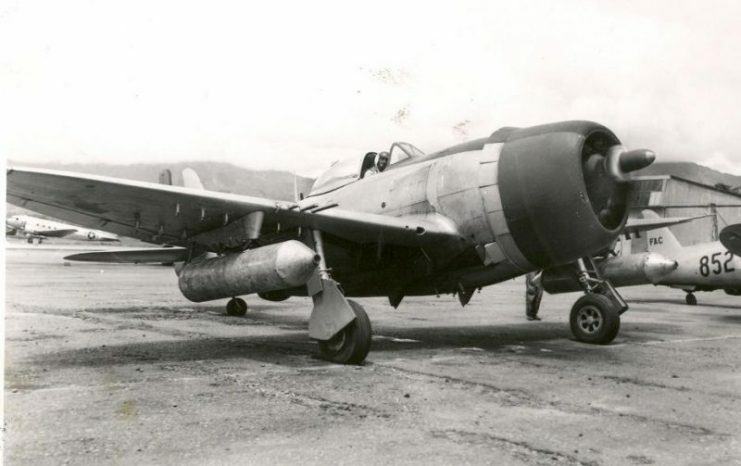 The second most built Japanese Fighter was the Nakajima Ki-43 Hayabusa/Oscar, of which almost 6,000 were built between 1940-1945, using the same engine as the larger Zero. **The Republic P-47 Thunderbolt: 15,636 aircraft were built during the years 1941-1945, including the aircraft sent abroad. With that score, the P-47 in all its variants could arguably claim to be the No 1 Most Produced US Fighter type during WWII, but it is very closely followed by No 2, the P-51 Mustang. **The North American P-51 Mustang was built from 1941-1945 and 15,588 aircraft were built, in all variants together. **The Curtiss P-40 Warhawk of Pearl Harbor/ Flying Tigers fame was built in over 14,000 aircraft. It served in the Air Forces of 28 nations. **The Change-Vought F-4U Corsair was also outsourced to Goodyear, Vultee, and Brewster between 1942-1953. In total, 12,571 aircraft were built. **The Grumman F6F Hellcat was produced as a carrier-based fighter. Introduced in 1943, a total of 12,275 aircraft were built. **The Lockheed P-38 Lightning remained in production throughout the war and ended at just over 10,000 aircraft (all versions). **The Bell P-39 Airacobra, built between 1940-1944, amounted to almost 10,000 units. Many went to the Soviets, the RAF, and the Italian and French Free Forces. **The Grumman F4F Wildcat — over 7,860 units were built, with quite a number assembled by General Motors. NB: Outside of this competition, the non-powered Glider Waco CG-4 built between 1942-1945 numbered almost 14,000 units! Photo above: The Mighty Jug, Republic P-47 Thunderbolt, is the winner if we count the numbers made during the war in the USA, but that score is not a guarantee that it could be classed as the best fighter of WWII. For many, that is an ongoing discussion, and each of you should decide for yourself. Like with cars and motorcycles, we must appreciate that not everyone has the same tastes or preferences. It makes the world more attractive to see the variation of so many types/models. **The Consolidated B-24 Liberator was the most-built US aircraft of all types during the Second World war, with a production of 18,500 units in all its variants. **The Junkers Ju-88, a fast bomber, had some 15,000 units produced in Germany during the war. **The Boeing B-17 Flying Fortress totaled 12,700 aircraft in all its variants. **The Vickers Wellington, the most built bomber by the British, ended with 11,462 units in all variants. **The Avro Lancaster, the UK’s most built bomber, constructed by Armstrong Whitworth, Austin Motors, Vickers amounted to 7,377 units. **The Handley Page Halifax was built in Britain during the years 1940-1946 and numbered 6,176 units. **The Heinkel He-111, a German medium bomber, had some 5,600 units built during the war years. **The Boeing B-29 Super Fortress was in production from 1943-1946, during which time 3,970 aircraft were built. It retired from USAF service in 1960. 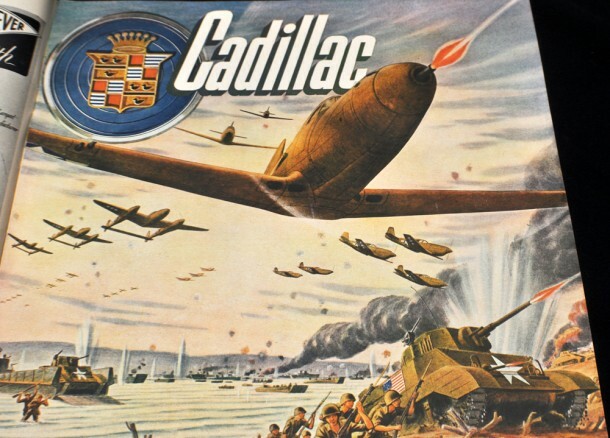 Photo above: Cadillac was involved in the building of engines for the Allied War Machine. We see in this ad both the P-38 Lightning and the Bell P-39 Airacobra with a 37 mm T9 Cannon, made by a division of Oldsmobile (GM), plus a variety of tanks and landing craft in the background. The propulsion of all that heavy metal was ensured by the Allied car makers. American Packard Motor Car Company also built a licensed version of the famous Rolls Royce Merlin V-12 engine, used in the Supermarine Spitfire, the Mustang, the Hawker Hurricane, the de Havilland Mosquito, and the Lancaster Bomber! Almost 150,000 units of that epic RR V-12 Merlin engine were built. Compare this score with the best post-war selling transport plane, the Boeing 737, in production since 1968, which has sold just over 10,000 units in March 2018. It is in its 50th year of continuous production. The legendary C-47 made more than that figure in only ten years’ time! (And not included in this figure are the 5,000+ Russian License Produced C-47s, named the Li-2 and the Yugoslav built Li-3). ** Most built flying boat in the world is the Consolidated PBY-5/6 (A) Catalina of which some 3,300 aircraft were produced between 1937-1945, more than all other seaplanes, flying boats, or amphibious vehicles of worldwide manufactures together! Like the Dakota, the Catalina enjoyed a most remarkable post-war career, mainly in its roles as a coast guard or fire fighter aircraft and transport of cargo to remote areas and islands where no airstrip was available. My illustrated book 80 Years, A Tribute to the PBY Catalina provides 400 magnificent photos which give a complete view of this amazing aircraft operating in its realm of faraway islands, lagoons, and lakes where the Cat could land at will. During the Pacific War, the Catalinas were camouflaged as “Black Cats” and post-war, they came into my life as civilian 16-seater converted PBYs. One of the eight Shell-owned Cats dropped me as a young kid with my Dad and Mom in the Borneo Jungle. It was the only lifeline for us to the faraway outside world. That made an everlasting impression, a compelling motivator to write this book which is my personal tribute to the best flying boat ever made. (NB: The Catalina poster, seen below, will soon be available with my new book). See also www.catalinabook.com for reviews and ordering. 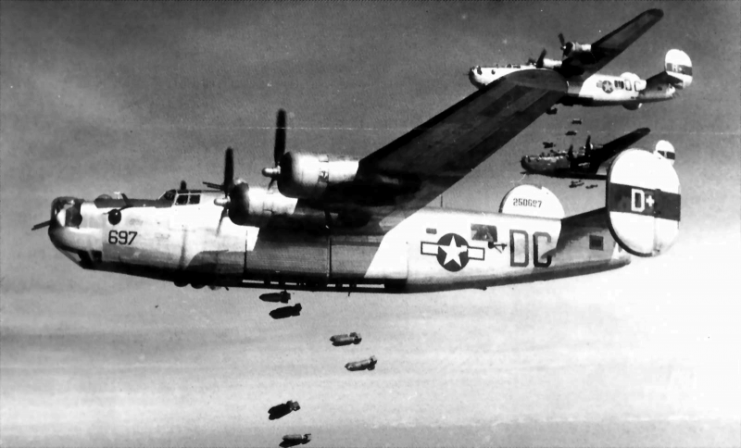 Photo above shows the winner of the competition “US most built aircraft during the war years” — the Consolidated B-24 Liberator, which also holds the world record of being the “World’s Most Produced Bomber.” Just under 18,500 units were produced and operated by the USAAF, the RAF, the Russians, and many British Commonwealth Air Forces during the war years. ** The US war effort resulted in the largest industrial production for any war in history. The merging of Military Interests for the defense of the country with its National Industrial Infrastructure Government took this to an unprecedented level. The Government urged the involvement of many “non-military” civil companies. They wanted those who had the skills, the labor force, the factories, and machinery to help with the development and mass production of weapons, tanks, aircraft, ships, trucks, etc. Studebaker, Chevrolet, Packard, they all built (aero-) engines, cars, tanks, planes, and trucks to propel the first ever 100% mechanized war machine that encompassed the globe for five years. Photo depicts the Pratt & Whitney Twin Wasp Radial 14-Cylinder piston engine R-1830 with a Hamilton Standard variable-pitch propeller. With a displacement of 1830 cu in (nearly 30 liters), the engine had a most successful career during and long after the war, with almost 175,000 units being built. 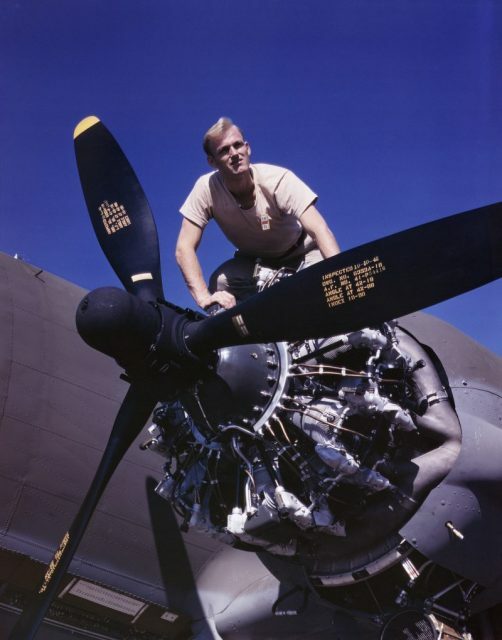 This engine was mounted on the Douglas C-47, (see photo), as well as on Consolidated’s PBY Catalina, PB2Y Coronado, B-24 Liberator, the Grumman F4F Wildcat, Short Sunderland V, etc. This history has been my specialist interest for almost 20 years. I have collected damaged and derelict C-47 wingtips and converted them to the DC-3 Wing Desk that I sell to private collectors, museums, and companies. I recently found a few more of these wingtips and will soon be converting them into a stunning desk, made out of an authentic war relic C-47 wingtip. I will come back to this topic in one of my next Dakota Hunter Blogs, so stay tuned! If interested in this Dakota Hunter Blog, please give it a Like, or share this blog with friends. Follow my Dakota Hunter page on Facebook for more fascinating Blog posts, published almost every weekend. Please click here.